So this will be my last blog post about Spain until I can go again. 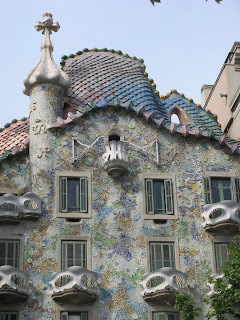 I spent half my vacation in Barcelona and was blown away by Gaudi's work. I was immediately taken by the organic nature of his buildings. They looked alive to me. The more I looked and the more I read, I could see how important nature was and how he incorporated it into his designs. 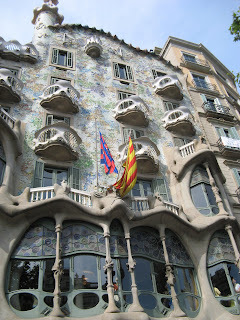 Here the Casa Batlló seems to have a water theme. The roof looks like fish scales, my partner said the balcony reminded him of a great white shark's smile, and the house is different shades of blue among other things. The Pedrera was supposedly inspired by a cliffside. He avoided straight lines and right angles basically because they are not found in nature. It's interesting to think of how unnatural our style of building is. My favorite by far was the Sagrada Familia. This was a truly awe-inspiring building. The pillars running throughout the cathedral look like trees. It made me think of cathedral grove here in Muir Woods. 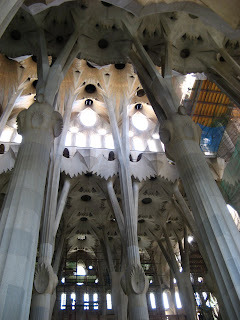 And there is a mini exhibit in the cathedral detailing the influence of nature on Gaudi's work. 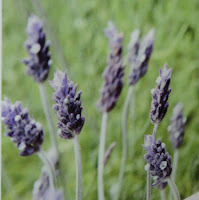 This comparison of one of his styles of towers with a lavender bloom was very interesting. I also thought of how Frank Lloyd Wright tried to design things to fit into the landscape and make as few ripples as possible. Gaudi went a different route. He designed for an urban space, but brought nature back into the city, the building. 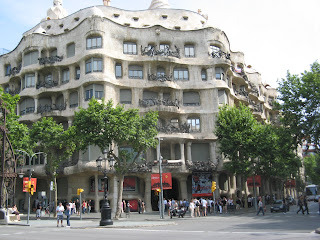 I think Gaudi got it right. So the other day I was looking at my garden and was disappointed by the number of things blooming compared to a month ago. 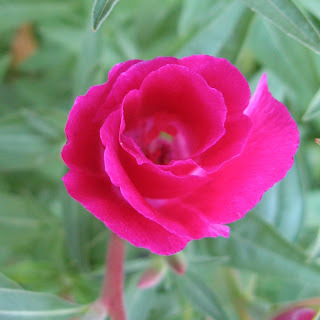 But as I looked around, I realized there is actually a lot blooming. And the front yard, which we just put in in the last 8 months (see more about that at rented garden) is also full of blooms. 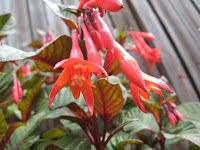 These fuschia are blooming like crazy along the side fence. 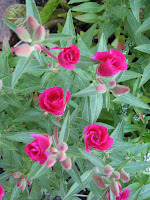 Here are some clarkia starting to open. They look almost like roses just opening to me. And here's part of the front yard. 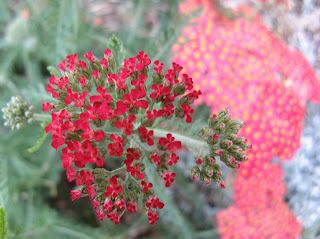 This paprika yarrow is an intense red right as it's opening. 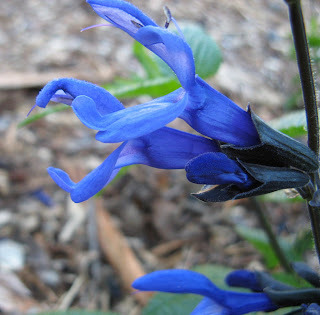 This salvia guaranitica 'black and blue' was a mistake. I was trying to buy 3 indigo spires and grabbed one of those and two of the black and blue. A beautiful mistake though. I love it. 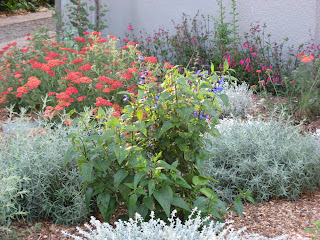 Also blooming in the gardens are two other salvias, passionflower, delphinium, foxglove, lots and lots of California poppies, and a few left over tidy tips and bird's eye gilia, as well as some of the veggies. 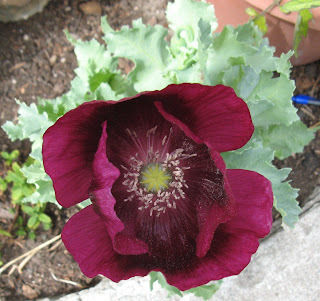 Thanks to Carol at May Dreams Gardens for hosting Bloom Day where bloggers post what's blooming now in their garden. So as I said in my last post, I was in Spain for my Spanish, but the gardener in me kept his eye peeled for interesting things. One of the more interesting things I saw were fruit trees used in unusual ways (at least compared to here.) Here in California there are all sorts of ornamental plums or pears used as street trees and in gardens, but in Spain there were a lot of fruit trees used in this way. They were actually producing fruit. Oranges were the main ones, but I also saw pomegranates. I can't imagine a city here planting trees that are going to drop softball sized oranges after a while. A friend living in Barcelona told me she hadn't tried them, but was told they were too sour to eat. This was expecially interesting. 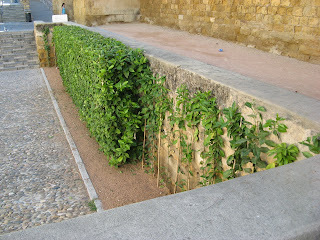 These, as far as I could tell, were citrus trees trained up a wall to form a hedge-like facade to the stone wall. Anyone ever see anything like this? 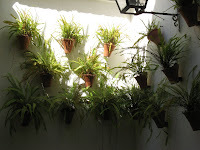 In Andalucia the houses have inner courtyards that are full of green growing things. I found this old take on a green wall kind of interesting. 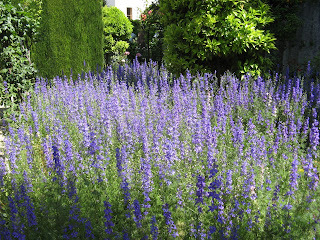 Some of the public gardens in Andalucia were not so inspiring. Low box hedges and roses. This was the main theme at the Alhambra. Seriously. 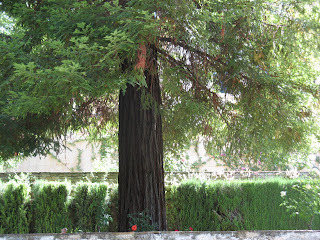 Here is a pic that is a little more inspiring a giant California coastal redwood towering over hedges and roses near the summer palace in the Alhambra. Well I haven't posted for a while because I went to Spain. The main purpose of my trip was to work on my Spanish and see some translations since I'm an interpreter. Interpreter first and gardener second. But while I was there I also had some time to look at some gardens to get some ideas for my second job. I was interested in the gardens there because California has a Mediterranean climate, one of only 5 regions in the world. The others being the Mediterranean basin, and parts of Chile, South Africa and Australia. They comprise only 2% of the world's land areas. It was interesting to see so many of the same plants that we have here. 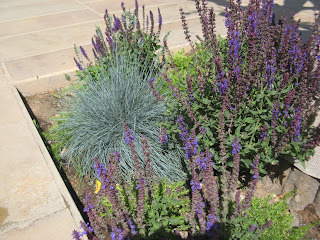 One thing that especially surprised me was seeing California natives used in gardens there. Here are some pics from the gardens in the Alhambra. 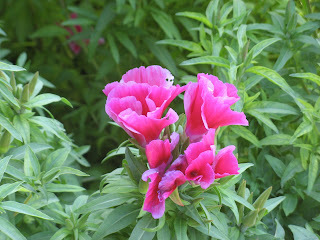 I was really shocked to see things like clarkia (1st pic), festuca idahoensis (2nd pic), larkspur (last pic) and more. And craziest of all coastal redwoods. (see next entry) Who knew?